My legs are pumping up and down at 90 revolutions per minute. My heart rate and breathing are both elevated, but steady. I hear the wind rushing past my ears. I hear the constant raspy sound of narrow tires as they grip the pavement, and propel me forward. The adrenaline is coursing through every muscle in my body, and it feels great! I’m riding my road bike. I am living in the moment. When the ride is finished, I will be exhausted and thrilled. Bicycles are affordable transportation and just plain fun. 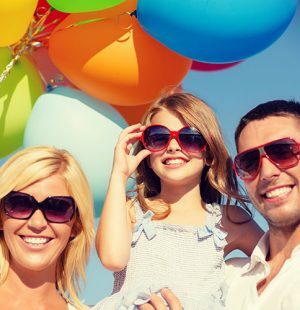 They are inexpensive, environmentally friendly, and the world’s most popular form of passage. More than 50-million bikes are built every year and about a billion are currently in use today. Bikes outnumber cars 2-to-1. There are many types of bicycles built for different purposes. Road bikes are the sports cars of the 2-wheel world. Lightweight and aerodynamic, the goal of a road bike is to put every ounce of your effort in a forward motion. All of that science and technology means road bikes can be horribly expensive. But they don’t have to be. With that in mind, Stuffoholics is here to give you our Top 10 Cheap Road Bikes list. 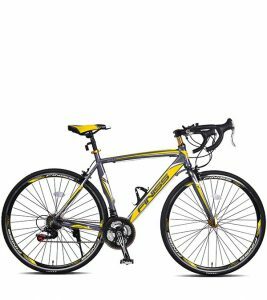 How Can I Choose the Right Road Bike for Me? For starters, we’re riders. We know the value of having the best bike you can buy beneath you. We know that the most inexpensive bike isn’t always the best value. But we also understand that you don’t want to bust your budget. With that in mind, we have tested almost a hundred cheap road bikes to come up with the 10 best cheap road bikes for you. During the four years we have been building this website, our aim has always been to assist our customers with adequate knowledge about the products we test. 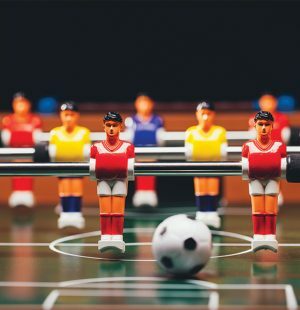 We want to help you make the right decision when you’re buying. In our search for the best value road bike, we spent about 70 hours of web research, and a week testing bikes by community-based usage. We personally tested the bikes and made sure the sale and online information was accurate. As biking enthusiasts, we have our personal favorites, but that is not factored into this report. Stuffoholics does not promote any brand or any particular product. As we said, our sole focus is on equipping you with the facts about these bikes. Whether you decide to get the best value, the top rated, or just an affordable bike that’s on sale, the decision is up to you. Based on different features and a wide range of needs, we have developed this list of what we consider to be the 10 best cheap road bikes on the market. Because bicycles can be ridden in many different ways, over widely varying surfaces and for many different reasons, not all bikes are created equal. A mountain bike is designed to ride on dirt trails, up and down hills, and even through the mud. Think of utility, or Hybrid bikes, as the daily commuter, perfect for riding to work or to the corner grocery store for a few things. Then there is the road bicycle. Its goal is to go as fast and as far as possible, with the least amount of exertion from the rider. 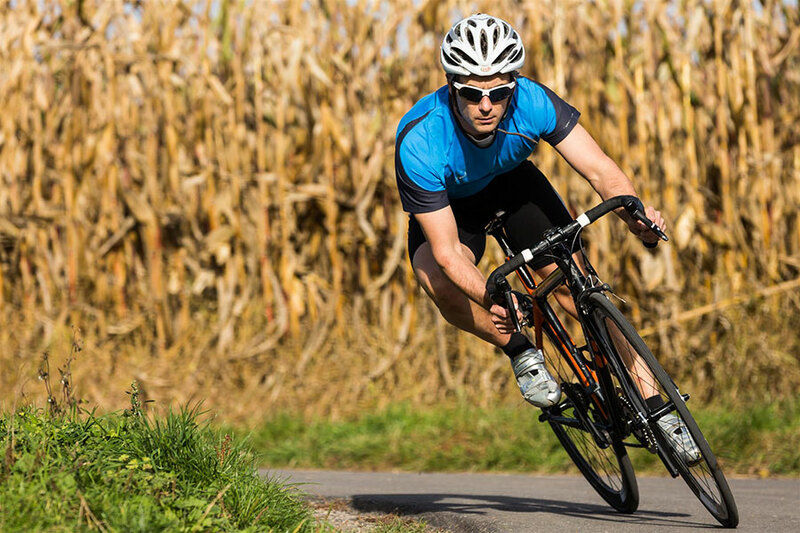 Often made of exotic materials like 6061 aluminum or even carbon fiber, and designed purely for speed, road bikes are as aerodynamically tuned as a race car. In fact, racing is what these bikes are all about. They maximize speed and minimize weight to allow the highest speeds even as they reduce fatigue. It’s what allows riders to cover a hundred miles or more in a day. Whether to choose a mountain or a road bike is a troublesome factor for many though. Aside from lightweight aluminum, Titanium, or carbon fiber frames, road bikes are distinguishable by their narrow, nearly tread-less tires. Some are equipped with “bullhorn” handlebars that stick straight out on either side from the stem. But the most popular design is the “drop down” style bars that curl down and under. They allow a rider to ride in an upward position by gripping the top portion of the bar, closest to the stem, or down low for better aerodynamics. The optional positions also give a rider the opportunity to vary their posture during a long ride. The first step in finding the best road bike at the best value for you is to figure out how you plan to use it. I like to ride in “Century” rides, which is a 100-mile continuous ride. A Century isn’t really a speed race, but it takes a lot of endurance. So my bike has to be light, aerodynamic and fast. I don’t want a lot of accessories on it because that’s just added weight, though there are some essential bike accessories that I cannot ignore. It’s a single purpose machine. That’s why I have 2 other bicycles. If you intend to use this bike for amateur racing, you need strength and efficiency in a cheap bike. You’re going to crash a few times while you get the hang of it, so learn on an inexpensive bicycle before you lay out the big bucks for a top of the line racing road bike. You may want to use your road bike for commuting to work. If you have good roads or, even better, nicely paved biking trails, a road bike can also be a good choice. You may want to add saddlebags, lights, or other comfort features. Some of the more cheap road bikes are ideal for this purpose. There’s no point in buying a $9,000 road bike when a budget bike will do. Also, if your focus is on gaining the benefits of bike riding for fitness purposes only, you can consider a spin bike for home use instead of a bicycle because that would be more practical for you. Are you going to do the maintenance on this bicycle yourself? If you are, avoid the more complex bikes. Some of them have shifting and braking systems that require specialized tools just for routine adjustments. You might want to consider one of the single speed bikes in our list so as to eliminate the hassle of dealing with finicky derailleurs. Start your quest for the best value road bike for you with the answers we just arrived at in the section above. You have already narrowed the field quite a bit by defining how you will use the bike. The intended purpose for this bicycle is the most important factor when choosing the right one. How the bike fits you is the next most important consideration. If a bike doesn’t have comfortable ergonomics that fit your body, it doesn’t matter how cheap or expensive it is. It’s going to end up hanging in the garage collecting dust. In the worst-case scenario, you could even end up with lower back pain and then look for ways to avoid back pain when biking. Handlebars and seats are adjustable and even replaceable with other designs, but the frame must be the right size for you. Most bikes come in a variety of frame sizes, so make sure you get the one that’s right for you. This can be tricky when buying a bike online, so the correct size is something you need to know before you order. If you plan to ride long distances, the lighter the bike is, the better. Even a couple of extra pounds can be exhausting. I have a steel bike and a carbon fiber one as well. When I go on a Century ride, you had better believe I’m taking the carbon. But carbon bikes are not cheap, so weigh the decision carefully. With literally hundreds of different road bike models on the market, it wasn’t easy. With the help of online reviews and expert opinions, we first narrowed our consideration for the 10 best value road bikes down to about 100. The selection process included practical testing data produced by a number of volunteers. With the help of road bike experts, we narrowed the list of cheap road bikes that represent the best value down to about 70. Then we focused on the specific features. Our volunteers offered their reviews of things like the gearing, frame, fork, rims, crank, chain, derailleurs, headset, speed and other features that stand out. We considered the quality of the materials used to build the bikes, and the warranty policy the maker offers. We also considered the sale price of each bicycle as we rated them. Since this is a review of our best 10 cheap road bikes, cost is a factor. But it’s also subjective. Carbon fiber bikes aren’t cheap, and don’t make this list, but may present the best value if speed is your ultimate goal. We gathered up all of the information that exhaustive research provided and broke it down into our 32 most important features. Then we held that list up against our tested bikes, to see how each of them compared. A link to that report is attached below, so you can study it for yourself. No bike we tested was perfect. But some come closer than others. In the end, we have come up with our list of 10 Best Cheap Road Bikes. Before I jump into my review of our Stuffoholics top rated bike, let me explain why it rises to the top. Vilano boasts of a number of fantastic features such as a sturdy yet lightweight aluminum frame, a 7-speed freewheel, 21-speed Shimano shifting components, and best of all, very affordable & perfect for daily exercise or commuting. This bike from Vilano does not contain the maximum number of the 32 positive features we studied. But it has the most important features by which a good, cheap road bike can be measured. As you can see in our attached research report, it has a 6061 Double-butted Aluminum Aero frame with 21-speed gear capacity. It is a fast bike for daily commuting, and durable for long time use. This makes this road bike a best buy. It has a KMC chain and 700c Doubled Walled CNC Machined Side rims for maximum durability. The Aerodynamic aluminum frame and alloy crank help keep the weight down. The price for this bike also helped make it the best choice. 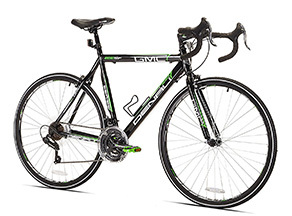 With all these great features the Vilano Aluminum Road bike has a sale price of about $250. We also compared the frequency of online ratings for each of the bikes in our test by looking at the most recent 30 ratings. Simply put, the faster a bike gets positive online reviews, the faster it is generating happy riders. This bike is receiving ratings at a very quick pace. It received its first ten ratings in 64 days, second 10 ratings in 86 days and third ten ratings in 103 days. 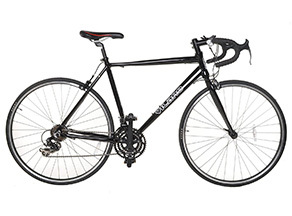 The Vilano Aluminum Road Bike is an affordable entry-level machine in the road bike category. It is lightweight, yet very durable. Thanks to the smooth Shimano drivetrain that Vilano has chosen for this bike, the experience of learning to ride a road bike is no longer daunting. If you buy this bicycle online, the assembly process isn’t daunting either. Reviewers have commented that the bike comes nearly fully assembled, and is ready to ride with minimal effort. The Vilano Aluminum Road Bike comes with a 21-speed Shimano drivetrain, so you’ll always have the right gear. The tires are a standard 700c x 25c size, which means finding replacements at any bike shop is simple. The bike weighs in at a very respectable 24 pounds, among the lightest in its class. The crankset is an alloy tripe with 50/40/30 gearing, and the freewheel has 7 speeds. The most difficult thing to learn when starting out on a road bike is how to shift gears. With three gears up front, seven in the back and two shifters on the bars, finding the right gear can be a complicated dance. For riders who make the smart decision to buy this bike, the learning curve just got flattened out. Vilano has chosen derailleurs and shift controllers from Shimano, arguably the industry-leader in bicycle gearing. The A050 SIS shifters are mounted close-in on the handlebars where they are easy to reach. You won’t win the Tour de France on this bike but you can certainly start practicing for it with this entry from Vilano. It is a terrific choice for daily exercise or commuting, as well as for those weekend tours down the nearest bike trails. This is a perfect entry-level road bike. So good, in fact, that it is so much more than entry level. The Shimano shifting system combines with a sturdy, yet lightweight frame to give a new rider comfort and confidence that will likely last for many years to come. It is good enough that it may actually be the only bike you will ever buy. 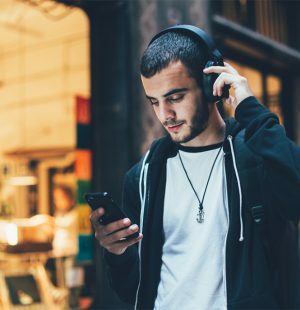 Why is this product Best for Entry Level? 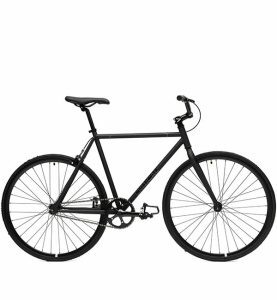 The Vilano Fixed Gear bike is a single speed bike that boasts of a strong steel frame, 700c double walled rims with CNC machined sides, is low maintenance & has a fixed gear/freewheel option. From our research report, you can see that this Vilano bike does not have the lowest price among all the products we have listed. But it has some effective features that elevate its value and make it a good road bike. That’s why we have selected it as our budget pick. This single-speed bike is just one solid color. There are no permanent decals or logos anywhere on the frame. It’s a blank canvas that you can customize any way you like. The frame and the fork are both hi-ten steel. The seat post and stem are alloy. It has a flip-flop rear hub that you can easily flip around to convert from a single speed bike to a fixed gear design. It is a simple bike with an easy design that makes it the beginner’s choice. Even with all of its great features, it can still be bought on a budget of about $160. We compared the online rating frequency and found this product is receiving ratings at a very good rate. It received the first 10 ratings in 77 days, second 10 ratings in 64 days and third 10 ratings in only 68 days. Despite being a low-priced road bike this one has 700c Double walled rims with CNC machined sides. If your goal is to get from Point A to Point B with the least amount of hassle and cost, this is your bike. This is one of the most almost maintenance-free bike designs we’ve found so far. Vilano is famous for affordable bikes that just work and this may be one of the best examples of that philosophy. 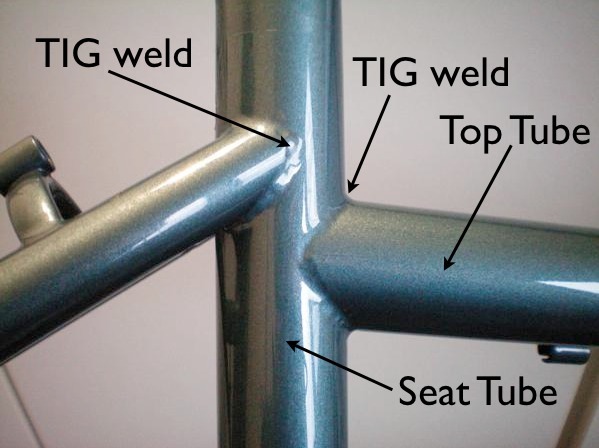 The frame is made of hi-ten steel that is Tig welded for maximum durability. The fork is also hi-ten steel. It simply won’t break. The wheels are 700C with double-walled CNC-machined sides. There are 2 versions of this bike. The drop-bar version has basic caliper brakes on the front and rear, but the riser bar version only has a rear caliper. Since it is a single speed bike, there are no shifters or other controls. Being a single speed bicycle, the level of performance you get out of it is entirely up to you. The energy you put into pedaling this bike is transferred directly to the rear wheel. That means you won’t hit the speeds and distances of, say, a 21-speed bike. It also means you can spend more time riding and less time performing maintenance, making it suitable for beginner bikers. Stuffoholics likes the fact that this bike comes without any logos or defining markings on it. We get to create the look of the bike ourselves. Also, isn’t your choice of bicycle all about personal expression? But the niftiest feature of this bike is actually the rear wheel. It has a gear on each side, and they are very different. One is a fixed gear, which means that both the crank gear and the rear gear turn all the time. If the rear wheel is turning, so are both gears. Flip the rear when around (which is very easy to do) and the “freewheel” gear comes into play. It means that when you stop pedaling, you can coast. The rear wheel keeps spinning, but the crank – and the attached pedals – can remain stationary. This bike should almost be considered as an entry-level training bike for riders who want to compete in bicycling racing on a track, known as a velodrome. 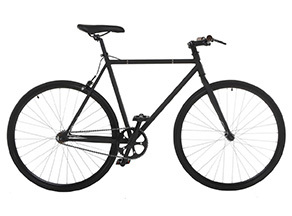 The fixed gear concept takes some getting used to, since you can’t just stop pedaling and coast to a stop. But, the ability to flip the rear wheel around to utilize the freewheel gear opens it up to street use. There are no advanced features to this bare-bones bike. But if you’re just looking for basic transportation for short trips, this could be the bike for you. This bike is has a hand-built ultra-tough steel frame, its rims have Deep-V double walls, and the rear wheel is a flip-flop hub and freewheel design, and an overall simple design for easy maintenance. For our advanced pick, we wanted to focus on cutting-edge features and advanced designs. 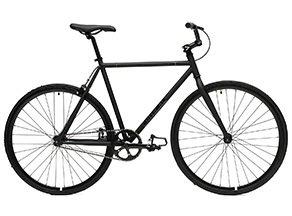 This single speed Fixie from Critical Cycles wins by racking up 10 key features. The hand-made steel fixed gear, a track frame with a flat top tube that has no toe overlap and enough clearance for bar spinning tricks are a few of those features. We also like the flip-flop hub design and the Deep-V double wall rims. That’s a lot of good for the $140 budget neighborhood. In terms of online reviews, the first ten positive ratings came in 142 days, the second in 103 days and the third in just 43 days. This is a durable bike that will keep on rolling for many years. The ultra-tough steel frame means this road bike can take on the rough and tumble condition of even the most beat-up urban streets without fear. The track frame is designed with a flat top tube, bar-spin clearance and no toe overlap. The rims are Deep-V double walls, and the rear wheel is a flip-flop hub and freewheel design. It’s the ultimate show-off machine! Its also makes a great commuter bike. With few moving parts and a simple design, it’s not going to leave you stranded halfway to work. It comes in three sizes and ten color combinations. The hand-built steel frame is extra strong for maximum durability. The Protek crank has a lightweight alloy chainwheel that spins a KMC chain. There’s not much to control here. Flip-flop the rear wheel for fixed gear or freewheeling, and squeeze the single Pro-Max brake handle to apply stopping pressure to the rear wheel, and that’s about it. On a fixie, the measure of performance is all about the rider. This bike will do whatever you tell it to do, and that’s all you want it to do. 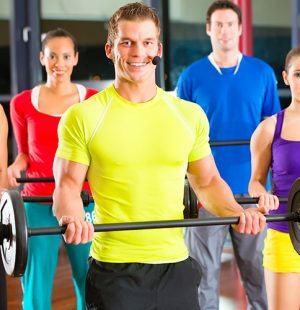 A solid performer, even if you use it only for exercise. For a bicycle with a sale price around $140, you don’t expect many features. But this one still delivers. Check out the brand name parts like the headset and bottom bracket from Neco, tires from Wanda and pedals from Well-Go. One more nifty feature – it comes boxed with the tools needed for assembly and maintenance of this bike. This is a cheap bike that doesn’t act like one. The single speed design cuts out a lot of cost and maintenance. Since it comes with its own tools, even maintaining it is inexpensive. 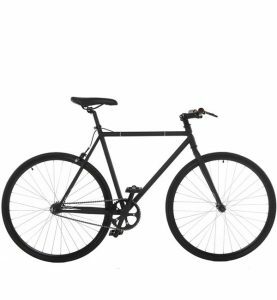 With its steel frame and sturdy rims, the Critical Cycles Fixie Urban bike is an ideal commuter in the road bike class. 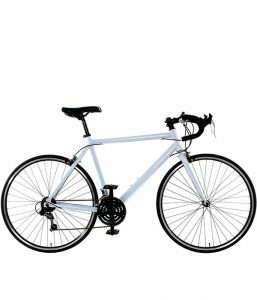 The Denali is a 21-speed road bike with a lightweight frame, high profile Vitesse rims sport 28mm tires, Shimano components, and a built in water bottle holder – all at a great price. Our testing found this bike to be an excellent choice for long distance riding. Frankly, it’s a lot of bike for about $240. 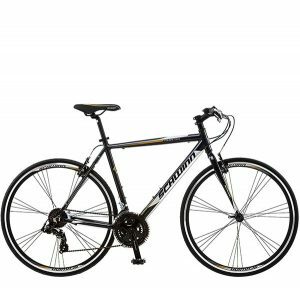 For an everyday rider looking for an affordable bike with some top rated features, this bike is worth considering. It’s aluminum frame results in a lightweight, yet durable design. The addition of some brand name appointments helps, too. With Shimano components handling the shifting and a Vitesse saddle giving you a comfy place to plant yourself, expect to ride this bike mile after mile. The Denali is a 21-speed road bike with a lightweight frame that tips the scales at 30 pounds with all components. The high profile Vitesse rims sport 28mm tires, and are supported by 36 spokes. The frame comes in 4 sizes. The frame is 6061 aluminum, a perfect mix of strength and lightweight. It also gives the frame a rigidity that most carbon bikes can only dream of. Alloy calipers and brake levers keep the weight down. The Denali comes with Shimano components to handle your gearing wishes. Up front, the Shimano Revo shifters make gear selection easy, and down low the Shimano derailleurs easily glide from one gear to the next without hesitation. The brakes are of the single-lever design, which means you must grip the bars in only one place to use the brakes. That’s a bit awkward if you are riding with your hands on the drop bars. Plenty of it. Put your feet on the nylon pedals, nestle your toes into the front-end cages, and off you go! With 21 speeds at your command, this bike will be up to max speed in no time. That nicely padded Vitesse saddle is great for long rides. Not many bikes come with a water bottle holder already mounted on the downtube. But this one does. Not a big deal, but it’s a nice touch. Everyone knows you have to buy a bottle holder, so why not put it on? The GMC Denali Road Bike is designed to take just about anything you can throw at it. The 21-speed gearing system lets you find the sweet spot between effort and result, and with the Shimano derailleurs doing the work, you can be confident that the gear you chose is the gear you’ll get. We aren’t real fond of the Revo shifter design. We prefer levers to dials, but that’s a personal choice you have to make. This is a very capable every-day bike suitable for almost anyone’s budget. Why is this product our Time trial and counter choice? This Vilano model is perfect for commuters with its great durability and aerodynamic design. It has a 6061 aluminum frame that’s rigid and durable, Shimano components, and mounting points for a water bottle holder on the downtube. This bike just might represent the best value in our entire list. It’s a combination of a good bike for high-speed riding and commuting with the durability needed to survive on modern (in other words, in bad condition) urban streets. The aerodynamic design of this commuter bike is coupled with some nice high-quality components to make this a very good bike. At about $200, it is also one of the most affordable bikes on our top ten list. Put those two factors together, and it is easy to see why this entry from Vilano is our top choice for an inexpensive commuter bike. 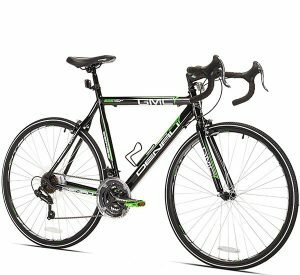 In our study of online reviews, the Vilano Aluminum Road Bike received positive ratings at an amazingly high rate. It got its first ten ratings in 41 days, the second ten in 83 days and the next ten in 126 days. One of the things our reviewers liked best was the hi-ten 700c 1 1/8” threadless fork design, which provides great shock absorption. This is a 21-speed, entry-level bike that will take you well beyond your entry into biking. The drop handlebars and 21-speed gearing will get you to where you need to go in a hurry. It has dual wheel brakes with alloy calipers to help you stop when you get there. Speaking of wheels, this bike is equipped with double-walled CNC machined rims with black anodizing for a clean look. The front wheel uses a threadless design for speedy removal and attachment. They sport 700c x 25C tires and the frame is available in three sizes. 6061 Aluminum with double butted seams makes this a lightweight yet very sturdy frame ready to handle the roughest of streets with confidence. The crankset is forged alloy with 50/40/30 gearing. The front fork is hi-ten steel for top-of-the-line strength and durability. Shimano is the leader in bicycle drivetrains, and Vilano taps into this stream for this bike. The derailleurs take their orders from the Shimano A050 thumb shifters. The brake handles are the single lever arrangement out front on the drop down bars. Deep insets over the brake handles provide a very comfortable resting position for your hands. This is a strong contender in the daily commute arena. 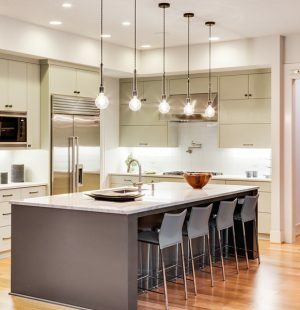 It is a fairly simple design, so maintenance is a breeze and breakdowns are rare. It is lightweight and fast, so you can count on it to get you where you need to go. The drivetrain components instill confidence in riders new to the process of finding the right gear among the 21 choices. The straightforward design of the dual caliper braking system means you can adjust them with ease for maximum stopping power. Simplicity is the marching order for this bike, so aside from the quality Shimano derailleurs, it doesn’t come with many added features. It’s up to you to add your own touches to this bike to truly make it your own. As a starting point, mounting points for a water bottle holder on the downtube include the screws. 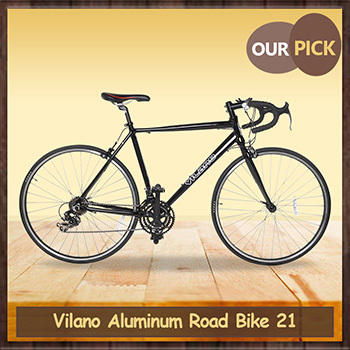 Stuffoholics really likes this aluminum road bike from Vilano. It’s a budget bike that thinks it was built for racing. Maybe it was! With a solid but lightweight frame powered by a top-rated drivetrain, this is a perfect entry level road bike that will supply many years of service. You might buy it for the entry-level and find yourself being very happy to stay with it for a long time. The Schwinn Phocus includes many features commonly found on more expensive fitness & racing bikes such as a 16 speed design drivetrain that utilizes integrated shifter/brake levers for smooth gear changes. This bike is a step up in the price range from the previous bikes on our list. At about $400 it’s not as inexpensive as the other entries, but once glance at the bike will tell you why. It includes many features commonly found on more expensive fitness and racing bikes. The drivetrain is a 16-speed design that utilizes integrated shifter/brake levers for smooth gear changes, even at high speed. The aluminum frame is led by a carbon fiber fork for agile, sturdy control up front. Schwinn has designed a nice aluminum frame with a very clean design for this bike. The Microshift shifters are integrated into the brake levers, meaning you don’t have to move your hands to shift or brake. This is the design commonly used on the highest rated racing bikes, so you’re in good company. The double walled rims have a paired spoke design for a really cool look. The Promax alloy brakes are a double caliper design for great braking. The front wheel has a quick release design. The aluminum frame is lightweight and very rigid. The addition of a carbon fiber fork is a huge bonus. It gives the front end maximum strength with minimal weight for agile steering control. The high profile rims are alloy. Look again at that carbon fiber fork. It is a strong selling point for this bike. If you have never used shift levers that are integrated into the brake levers, the design can be confusing at first. But this is how all top rated racing bikes are designed, and for good reason. With the flick of a finger, you can shift gears without ever taking your hands away from the brake levers. Once around the block is all it takes to get the hang of it. Once you learn to use them, you’ll never want to ride with anything else. Schwinn has done you a favor by making this bike a 16-speed machine, as opposed to the more traditional 21-speed design of many bikes. 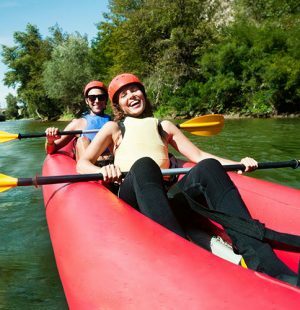 Spend less time trying to find the right gear, and more time moving out! Shimano derailleurs keep the drivetrain in line for you. Toe clips and straps are included on the pedals to make sure every ounce of your effort is translated to the rear wheel. This well-designed frame and fork are outfitted with a good-looking set of drop down bars and a quick release seat for easy adjustment. The front wheel is also a quick release design. A first-time road bike rider will certainly feel right at home on this bike with just a little practice time for the integrated shifting. And a long-time road bike rider will also feel at home on this very capable bike. What we’re trying to say is that this is more than just an entry level bike It’s a very capable road bike that can be with you for as long as you want. The one-size Takara Kabuto is a single speed bike that features rear flip-flop hub with a fixed gear and a freewheel, and a rigid black frame with brightly colored decals and tires that really stand out anywhere. Single speed, single size, and splashy colors – all of these sum up the Takara Kabuto. But the simplicity doesn’t mean this doesn’t have some good things going for it. It wouldn’t be on our best budget road bike list if it didn’t. Online reviews for this bike suggest it has plenty of loyal riders. It comes in just one size. The company says the 57-centimeter center top tube fits riders from 5’10” to 6’2”. If you’re not in this height range, move along. This bike is not for you. It has a rear flip-flop hub, with a fixed gear on one side and a freewheel hub on the other. This bike has a Tig-welded steel frame for ultimate strength and rigidity. The rims, hub and side-pull brakes are all alloy. This is a steel bike, so it’s heavy. It is also a single speed bike, so it’s not exactly fast. Still, the drop down bars and comfortable ergonomics (for those of us who fit on this bike) make this an interesting bike. The most stand-out feature this bike has going for it is the bold color schemes it’s offered in. There’s a black frame with bright green decals and tires, a royal blue frame with light blue decals and rims (black tires), a green frame with blue tires, and a black frame with yellow tires and decals. You won’t get lost in a crowd. It also comes with toe cages on the pedals to help you maximize power. The bright color palette employed on this bike just screams, “Look at me!” Online reviews from buyers are overwhelmingly positive. If you’re in the market for a single speed bike, this one is worth considering. Just make sure it will fit you because, aside from the seat adjusting up or down, there are no frame sizing options. This bike from Schwinn is made of an aluminum frame with high-profile alloy wheels, Shimano’s A050 shifting system and derailleurs, which makes for agile handling and quick responsiveness. This bike is a brother of our Number 6 pick, with just a few modifications. Schwinn bills this as a “fitness” bike, suggesting that its intended use is all about riding a bike to stay in shape. Reviews of this bike are overwhelmingly positive, so Schwinn is doing something right here. 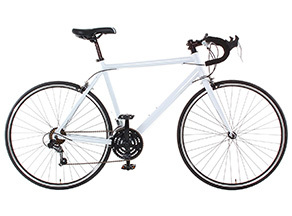 This is an aluminum framed road bike with a very rigid fork to provide agile handling and quick responsiveness. It has a 14-speed drivetrain, with two gears on the crankset and a seven gear cassette on the rear hub. It is a drop bar design with lever shifters and dual caliper-style brakes. As mentioned, this is an aluminum framed bike. The wheels are high-profile alloy with paired spokes for a very cool look, and the brakes are also alloy. Shifting is accomplished with Shimano’s A050 shifting system and standard Shimano derailleurs. The front wheel is a quick release design, and the seat post also has a quick release clamp for fast height adjustments. Schwinn has been building bicycles since 1895, so you would expect that by now, they have this performance thing figured out. They do. This is an agile performer on the street or paved bike trail. The frame is light, the derailleurs are competent, and the bars designed for speed. This bike will give you all the performance you ask from it. This is a lot of bike for the money. It’s a sharp-looking, lightweight performer that is sure to give you many miles of enjoyment out on the trails or streets. Online reviews couldn’t be in more agreement with our assessment. You won’t go wrong by adding this bike to your outdoor sporting equipment. The well-designed Merax bike features an aerodynamic aluminum frame with excellent control features, 21-speed drivetrain with Shimano derailleurs, upgraded rims & a kickstand, all adding up to its beauty. This is a sharp looking, well-designed entry in the road bike category. In the words of one online reviewer, “So great that people will want to steal it. Lock it up!” ‘Nuff said. This Merax bike has an aerodynamically designed frame that will slice the wind like a hot knife through butter. At 28 pounds, it is reasonably lightweight, but still very sturdy. The 21-speed drivetrain is guided by Shimano’s Tourney series derailleurs. It comes in 3 different color combinations: Green & Black, Red & White, and Yellow & Gray. This is a 6061 Aluminum-framed bike. In fact, there is a lot of aluminum on this bike. 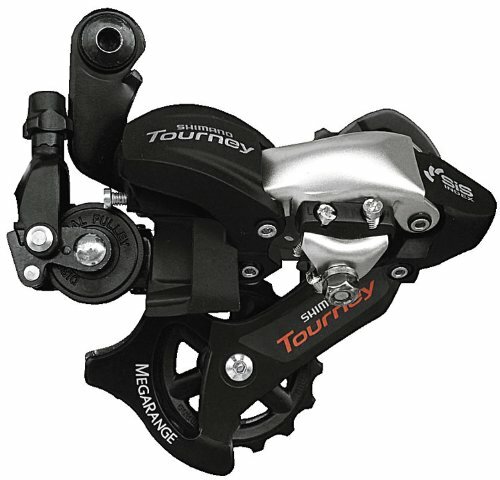 The aluminum caliper brakes and aluminum rims are a definite step up from the alloy components so common to most cheap road bikes. Even the seat post is aluminum. The front fork, however, is very rigid steel. It might add a little weight, but the rigidity of a steel fork also adds a great deal of confident control. 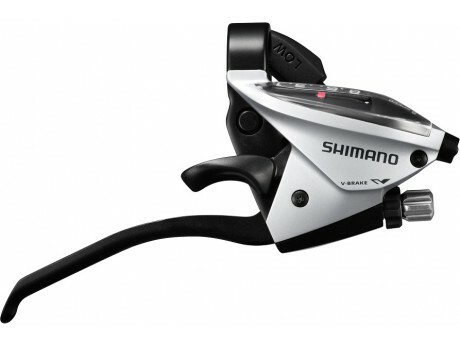 Shifting is done through Shimano’s capable SA050 lever system. The front derailleur is a Shimano TZ-31 and the rear is their RD-TZ50. That’s good stuff. The front wheel is a quick releases design. The performance of this bike is as good as it gets for any bike in this price range. It is a very capable machine that even a serious road biker would be happy to ride for many years to come. The seat provided with this bike is cushy and comfortable. This bike comes with a couple of added features that we know you are going to love. For one thing, it has an aluminum kickstand – something that most cheap road bikes have done away with. But you’ll want to use it to keep this pretty bike from laying on the ground. The other bonus feature is a top frame mounted pannier bag that Merax includes with the bike. That’s one necessary accessory that you won’t have to buy. Merax isn’t a well-known brand, but this bicycle just might put them on the map. It is stylish, very agile, and certainly a road bike worth considering. Owners of the bike agree. 84% of online reviews give this bike a 4 or 5 rating out of 5. That’s about as good as it gets. 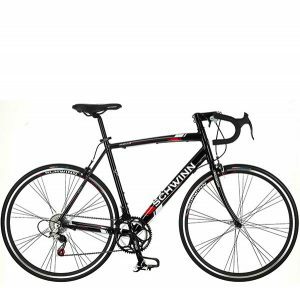 This bike from Schwinn features a lightweight aluminum frame that yields good speeds, and has a sleek design that makes is a delight to ride. Best of all, it comes with a lifetime warranty. One online reviewer calls this a champagne bike on a beer budget. We’re not sure we would go that far, but Stuffoholics does like this final entry in our top ten list of cheap road bikes. It is certainly a capable machine and offers a couple of features the other bikes in our list don’t. The frame is an aluminum fitness design, which means it isn’t built for racing. This bike is designed for getting out on the track or trail and doing your daily workout in a real-world environment. Gyms are for wimps. It’s a 21 speed drivetrain and has linear pull brakes. This is not our favorite style of brake, but still very functional and easy to adjust. This bike comes in one size only and the handlebars are not adjustable. The frame is 6061 aluminum for good rigidity and lightweight. The wheels and crank are alloy, so are the arms on the braking system. The bullhorn handlebars are completely straight – no bend at all. It’s a personal preference as to whether you like that design or not. In fact, we don’t. The brake levers and Shimano EZ Fire shift levers are an integrated system that is perfectly positioned on the bars, and couldn’t be easier to use. This bike’s lightweight and sleek design make it a delight to ride. It’s a very fast bike and rides like models that cost three or four times as much. Handling suffers a bit because of the handlebar design. There is one outstanding feature of this bike that we have to mention. It comes with a Lifetime limited warranty for the original owner. There are some things to be careful about if you are considering this bike. Aside from the seat post, there are no adjustments that you can make to properly fit this bike. If it doesn’t fit right out of the box, you will have to invest in different handlebars, or at least a stem riser. Frankly, we don’t like the handlebar. But, this is a design choice that you might like. Study it carefully. In all, this is a sharp-looking road bike capable of good speed. It may not look like a very complex machine, but a road bike is a finely-tuned instrument. If a component falls out of adjustment it can wear out quickly, or even fail on you when you are 50 miles from home. There is no substitute for routine care and maintenance. For starters, if you buy one of these bikes online and assemble it yourself, it is very likely you are going to have to take it to a local bike shop to get it tuned up. Derailleurs are particularly finicky about being adjusted perfectly. If the cable adjustment is too long or too short by a millimeter or less, you could find yourself unable to shift to the desired gear or even have your chain come off during shifting. These are very precise adjustments. Our maintenance routine goes like this. We check the tire pressure every single time before we take the bike out. It is not uncommon for these narrow, high-pressure tires to lose a few pounds every day. A properly inflated tire lasts longer, and rolls easier, which means your energy isn’t getting wasted. We wipe the bike down after every ride. Two minutes with a cloth isn’t difficult and always keeps your bike looking new. It also gives us the opportunity to spot any loose parts or damage that might have occurred on the ride. Lubricate the chain regularly with a specialized lubricant. Check the brake pads regularly, and look for uneven wear. Turn the bike upside down and spin the wheels, looking for any sign that the rims have become out of true. If they don’t spin in a perfectly straight line, you need to take the rim to a trained repair shop to get the spokes trued. We also recommend taking your bike to a professional repair shop at least once a year for a thorough retuning of every component. This may seem like a lot of maintenance, but it really isn’t. If you perform the 2 minutes worth of small steps every time you roll out on your bike, it will give you many miles of faithful service. Picking the right road bike for you is as personal as a decision gets. Identify your needs and goals, then narrow the choices by eliminating bikes that don’t fill your needs. Then start looking at the kind of features you want, and the quality of components you need. It’s not necessary to overbuy a bike. If you’re going to do a casual ride a few times a year, you don’t need a race-grade carbon fiber bike that will set you back thousands of dollars. 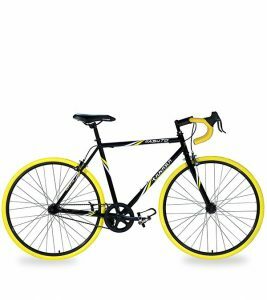 If you have a short ride to work, you might want to consider the simplicity of an inexpensive single speed fixie, like the GMC Denali Road Bike that you can lock up on the bike rack outside the office without fear of theft. On the other hand, if you plan to ride several times a week as part of a fitness program, you should look to the multi-speed bikes with aerodynamic and lightweight qualities. Above all, be sure to get the right-sized bike for you. An ill-fitting bike is going to end up as a decoration on your garage wall. The bike is just the first part of your purchase. Remember that you may also want to invest in some racks and saddlebags or panniers so you can carry things, particularly if you plan to use the bike for commuting. You are also going to need a sturdy lock to protect your bike when it’s sitting in the rack. 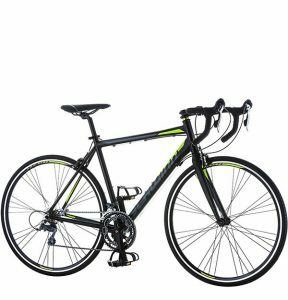 Road bikes are fun, fast, useful transportation that comes in a wide range of styles and prices. The range of options can be bewildering when you decide to seek out a new bike. 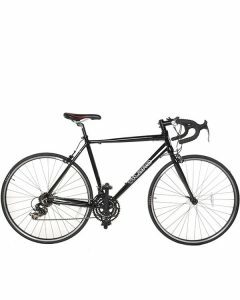 But this Stuffoholics guide to our picks for Top Ten Cheap Road Bikes is a great place to start. Happy biking!